Puri Bagus Lovina is the first luxury hotel in the area. Built in traditional Balinese thatched roof architectural style on 20,000 square meters of beach front and offers 40 spacious villas, including two suites, which with private pool and dining room. The free form main swimming pool overlooks the ocean, just a few steps away. Bali, the island of Gods, is a unique kaleidoscope of color, culture, artistic, expression, breathtaking landscapes and home to a gentle and hospitable people. Puri Bagus Lovina enjoys a perfect beach setting on the outskirts of the Lovina resort area, the northernmost tip of Bali. It is only a few minutes drive to the ancient town of Singaraja, the island's former Dutch Colonial capital. This region, rich in spices and coffee plantations, holds spellbinding scenic sites as well as cultural and historic heirlooms. A golf course of international standards near the Beratan Lake in the cool mountains of Bedugul is less than 45 minutes away. The stretch of Indian in front of the hotel holds beautiful coral formations and the opportunity of early morning dolphin watching. * The guest rooms offer touches of old Bali, such as a large open air verandah and Balinese open air secluded showers in the privacy of interior gardens. * Private mini bar - all clustered around spacious and beautifully landscaped tropical gardens. The hotel's restaurant serves sophisticated international cuisine. Light snacks are available throughout the day at the poolside. The bar specializes in tropical cocktails and carrier major international brands of liquor. For guest convenience there is an in-house boutique/souvenir shop and drugstore. * High season supplement at USD 15.00/room/night for 1 - 31 August 2005. 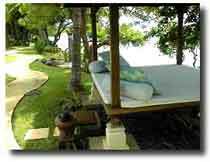 * High season supplement at USD 15.00/room/night for 20 December 2005 - January 5,2006.